Hong Kong in Chinese means a fragrant harbour. Nowadays, it is a prosperous and exciting metropolis where Chinese and Western cultures fuse. It is divided into four distinct parts that cover 404 square miles: Hong Kong Island, Kowloon Peninsula, and the New Territories, including 262 outlying islands. Hong Kong became a colony of Britain due to the defeat of the Opium War. It returned to Chinese sovereignty in 1997 and is now designated as a Special Administrative Region (SAR) of China. Governed under the principle of one country, two systems, Hong Kong remains highly autonomous and is allowed to retain its present social, economic and legal systems for at least 50 years after the handover. In mid-2012, the population of Hong Kong was 7.14 million. Chinese made up 94% of the total population, other ethnicities such as Filipino and Indonesian occupied the rest 6%. English and Cantonese are the official languages of Hong Kong. All road signs and notices are posted in both languages. Cantonese serves as the most widely spoken language. Most people in service industry understand and speak English. 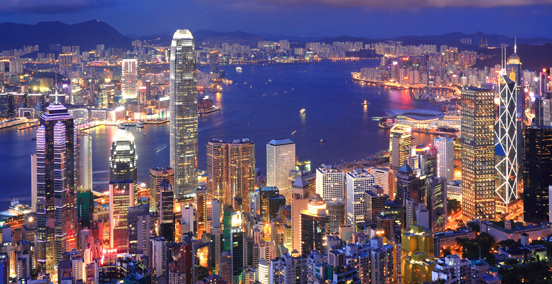 Located at the south eastern tip of China, Hong Kong is at the same latitude as Mexico City, the Bahamas and Hawaii. Due to its tropical monsoon climate, two seasons dominate the year. One is consistently hot and humid (the Southern Monsoon in Spring/Summer) while the other is cool and crisp (the Northern Monsoon in Autumn/Winter). Typhoons may be expected from May to September. Typhoon and monsoon warning signals are announced on the website of Hong Kong Observatory and are regularly broadcasted on radio and television. It is advisable to check with your school/company in advance what the arrangements are when warning signals are on. The Chinese lunar calendar is a calendar incorporating elements of a lunar calendar with those of a solar calendar. Not only can it be found in China but also in most of the East Asian countries. For convenience sake, the Western calendar is used for day-to-day activities, but the lunar calendar is still used for marking holidays for traditional festivals, choosing the most auspicious date for moving into a new apartment, weddings, business & shop openings and more! The Chinese Zodiac is a scheme that relates each year to an animal. Check out the below table to see which sign you belong to! Hong Kong enjoys a high degree of religious freedom, guaranteed by the Basic Law. Although Buddhism, Confucianism and Taoism are the main beliefs, there are also large Christian and Catholic communities. In addition, there are Sikh, Muslim, Jewish, Hindu and Bahá communities as well. There are numerous Hong Kong-based banks, foreign banks and banking institutions in Hong Kong. To open an account, please check with the bank you are applying as each has different requirements. Basic requirements are ID card or passport and address proof in Hong Kong. Employment contract and salary proof are required for overdraft facilities and credit card application. In addition, most banks have an initial deposit requirement and minimum balance requirement. Getting connected to people around you and the Internet is not difficult in Hong Kong. The telecom service providers in Hong Kong provide different network for customers to choose from, for instance, 2G, 3G or even 4G and it only takes 10-15 minutes to get it done. Hong Kong's residents are provided with a comprehensive range of medical and health services by the public and private sectors. Star Ferries travelling from Tsim Sha Tsui to Central and Wanchai connects Kowloon Peninsula and Hong Kong Island across the Victoria Harbour. Other ferries travel from Central to outlying islands like Lantau Island, Lamma Island and Cheung Chau. Octopus is a multiple use smart card. It can be used on most of the public transportations, convenience stores, supermarkets and most of the fast food restaurants. Octopus card can be purchased at any MTR station. Top up can be made at convenience stores, supermarkets or through "Add Value Machine" at MTR stations. Hong Kong is known as the "Gourmet Paradise", where mouth-watering cuisines from different countries can be found and enjoyed. From Michelin three-star restaurants to street stands, from tranquil café to crowded pubs, the abundance of choices here will always ensure you a bon appetit. There are wide ranges of Chinese regional cuisines in Hong Kong. The most popular ones are Cantonese, Chiuchow, Peking, Shanghainese and Sichuan cuisine. A quick lesson on how to use chopsticks! Step 1 - Hold one chopstick still in your thumb joint. Step 2 - Balance the other chopstick between your index finger and middle finger. Step 3 - Use your thumb, first and index fingers to manipulate the second chopstick in a pincer movement. Hong Kong is a city infused with flavours all around the globe. No matter which corner of the world you are from, you can always find the taste of your hometown here. Containing an excellent mixture of numerous cuisines, ifc mall is just a step away. From the genuine beauty of Japanese kaiseki to the mellow taste of world's premium vintages, you will have the prestige of being served by top-class chefs with their works of art. With one million square feet, ELEMENTS not only covers pure shopping bliss but also houses many restaurants that provide customers different styles of cuisines. The Michelin Guide is a series of annual guide books published by the French company Michelin for more than a dozen countries. Every year, there are more than 50 restaurants in Hong Kong being awarded with Michelin stars. Talk about "Gourmet Paradise"! You can also find various delicious food on OpenRice, which is a food and restaurant guide website including over 40,000 restaurants in Hong Kong. The restaurants are categorised by cuisine, district, average spending per person and more. Hong Kong is a famous "Shopper's Paradise". You can take advantage of Hong Kong's duty-free status and shop around major shopping areas. The supermarket chains in Hong Kong provide customers a wide range of products, from local to imported goods. Customers can always get everything they want in one go. Delivery service is provided by some stores. Although Hong Kong supermarkets sell almost every kind of food, the locals tend to buy fresh items from public markets governed by the Food and Environmental Hygiene Department. Take Exit D1 from the MTR Central Station and head up to D'Aguilar Street. 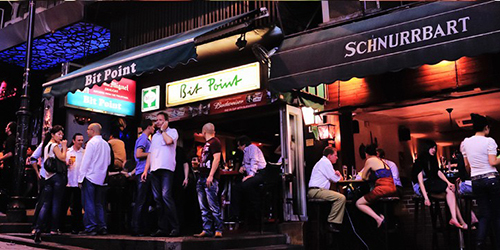 You will find the narrow and cobblestone lanes of Lan Kwai Fong, home to over 100 restaurants and bars. 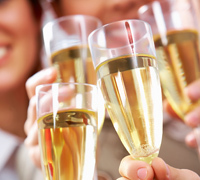 Not only a good place for you to grab an after-work drink, visit here on special occasions such as Rugby 7s, Halloween or New Years Eve, and you will lose yourself in an ocean of joy and mania. Prosperous along the Central-Mid-Levels escalator, the Soho area is just a few steps away. This entertainment zone got its name from its location: South of Hollywood Road. Similar to Hong Kong as a whole, this is a district balancing between the Chinese and colonial culture that shaped it, and the recent contemporary developments. Apart from restaurants and bars, this area also consists of art galleries, antique stores, beauty salons and even museums. Here you can find a wide variety of international culinary delights. Not only Asian and western cuisines but also exotic cuisines like Turkish and Russian. Some people regard it as Kowloon Lan Kwai Fong. 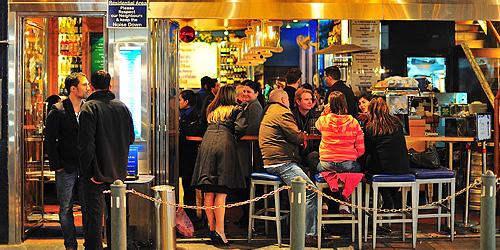 There are open-air pubs and restaurants along the street where you are offered a sensational dining experience. In Hong Kong, there are a lot of places with natural scenic beauty for your enjoyment with friends and family. For more information on local attractions and tours, please visit the Hong Kong Tourism Board website. The Leisure and Cultural Services Department (LCSD) is responsible for promoting high quality arts, cultural, leisure and sports activities. Check out their website to know more about arts and cultural events in Hong Kong. If you are a book lover, the Hong Kong Central Library is the place for you. Apart from the central library, there are smaller public libraries in other districts of Hong Kong. The service provider list is for reference only and readers are free to appoint any providers not contained herein to carry out any required works as it thinks fit. Readers shall make its own judgment as to the price, quality and whatsoever in relation to the products and services provided. Any disputes arisen as a result of any transactions or agreement are to be settled between the providers and readers.